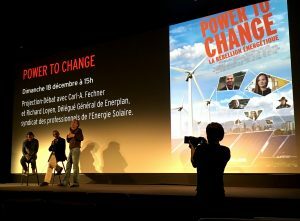 Our French distributor Jan Roeloffs from JUPITER FILMS had an amazing theatrical release with POWER TO CHANGE – La Rébellion Énergétique in France on 11th of January 2017. Carl-A. Fechner was available for a discussion in Paris. Check out further cinema screenings.